Common Materials For the Blade Surface: Hinoki, Limba, and Koto. This topic will be very interesting for members on this forum. I'm not sure how much you will agree with my analysis because it's about more than mechanical calculation. In some ways, this part should be about considering each player's style, e.g., type of swing, what angle is comfortable for a backhand and forehand stroke when looping, how long the ball remains on the blade when making a spinny shot, the impact of the swing movement when generating powerful topspin, ball friction when maximizing a pips-out rubbers' effect, and so on. So, this article will be a general one — please don't expect me to be a fortuneteller for table tennis blades. Ok, let's start with the "staying moment,” which is the term I use to explain my thoughts about surface materials. When making a topspin shot, some players keep the ball on the blade for specific amount of time, which is long enough to help them generate a massive spin on the ball. Normally for beginners, this movement goes slightly around, grazing the ball without penetrating deep. The blade draws a big round circle. But as players become faster and more powerful, the movement becomes easier. Some players use their wrist when they make a topspin shot, from backward to forward, not only from downward to upward. If this movement occurs at a short point of impact, the loops will be more extreme and difficult for an opponent to return. When playing against top players, you will often experience having to return a faster, spinnier ball than what you normally would encounter. Watching high-level players play is much different than actually playing them! You will need to keep your blade tight and be stable when you block because the ball seems to shove your blade back. And you may be thinking, “Why isn’t my topspin like this?” “How can I make my topspin this fast and spinny?” And some of you might have tried to make a faster swing movement, but only to discover that this is not the practical answer. 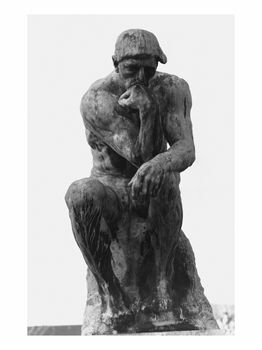 As previously mentioned, sometimes it's about wrist movement, arm folding, or other factors. But, I can say one thing for certain — It's about impact! When you hit the ball with your blade, the blade is at the highest speed, and the ball needs to be smashed both ways, from down to up, and also from back to forth. It may seem like too simple of an answer, but consider what will happens to the ball and rubber when you make that powerful shot. In that moment, the ball goes into the rubber, from top sheet into sponge, and finally into the wooden surface. For strong loopers, this impact happens all the time. They know how to make the ball sink deep even into wood. So, when you make such a powerful shot, even if you are not looping, you can still hear the loud sound of the ball's impact on the wooden surface of the blade. If you don't hear the sound, which normally happens when you smash without a spinny movement, then it means that you are not effectively doing a high level shot. 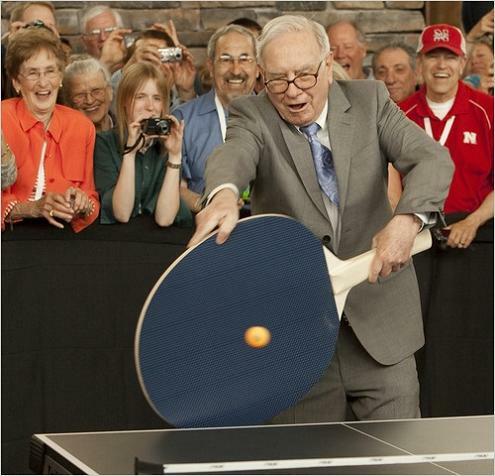 Anyway, it's not the most important factor in table tennis. As far as I know, there are some good players who cannot make this "bang" sound when they loop, but still they are really powerful and win many matches. By the way, whenever I make a blade, I discriminate the "staying moment" for general swing movement from the "bang" looping movement. Some blades can be good for a general swing, but not good for a "bang impact". Often, when you land a bang impact shot on the table, your opponent will not even see the ball because it is too fast to be recognized. The ball seems to disappear. The impact generated by this kind of shot distorts the top sheet of the rubber and also distorts the sponge upon to the blade surface, making a loud BANG! I don't want to degrade Chinese blades, but many of their blades are not good for a bang impact shot. They tend to focus on the feeling and power onto the table movement, which is about a small, but quick swing. So, they don't believe a blade has to be powerful with that bang impact shot. Ok, now let's get to the point. From my description, you know there are two different kinds of loops. I will now explain the general differences between the three most popular materials. Hinoki is normally very soft. It becomes damaged easily, so you need to be careful about it. Limba is still soft, but harder than Hinoki. Koto is hard and solid. I’m not sure how to express this part, but I will try. Hinoki feels sticky. When you loop, the ball seems to follow the movement of the wood. 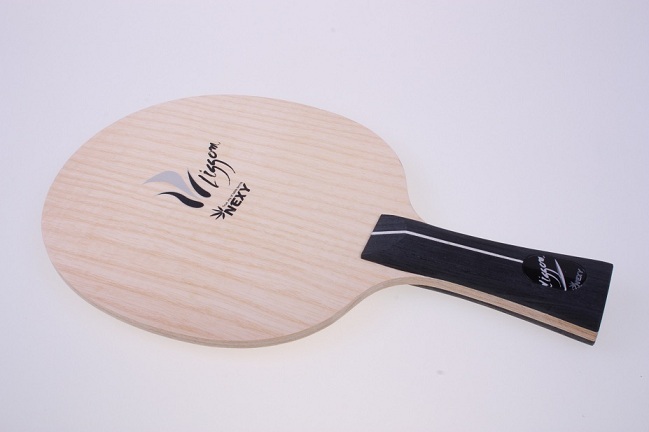 Limba feels like it embraces the ball, but this depends on how thick the Limba is that you use. 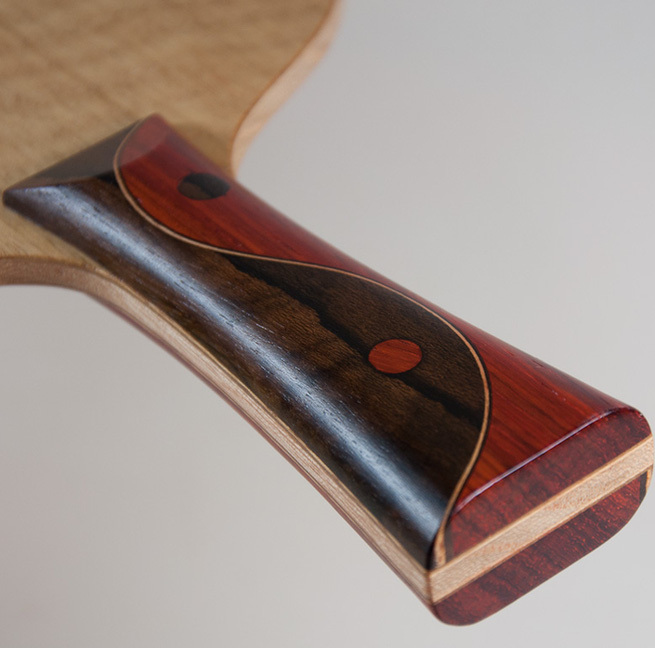 Generally, most blade uses thin Limba that is less than 0.7mm, and you will feel it holds the ball into the center. Koto is hard, and normally we use a thin ply for the surface. Koto is also heavy, so we don't use it for the center ply. Generally, blade designers believe that hard surfaces would not be good for generating a big spin. But recently, they are using Koto in many blades, because with Koto they can make full use of rubber’s effect. If you use Koto on the surface, it should be very thin, if not, the blade’s overall feeling will be too solid, resulting in a dull blade. 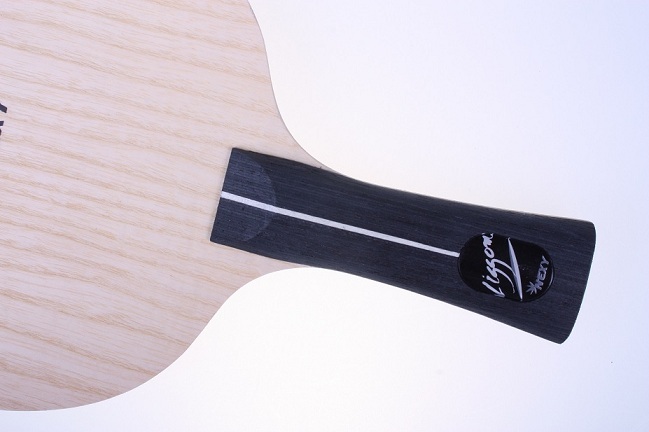 A thin ply of Koto works like a metal plate that has a positive effect on the rubber. Now we have two factors — Hardness and Feeling. But this cannot be mechanically simple. 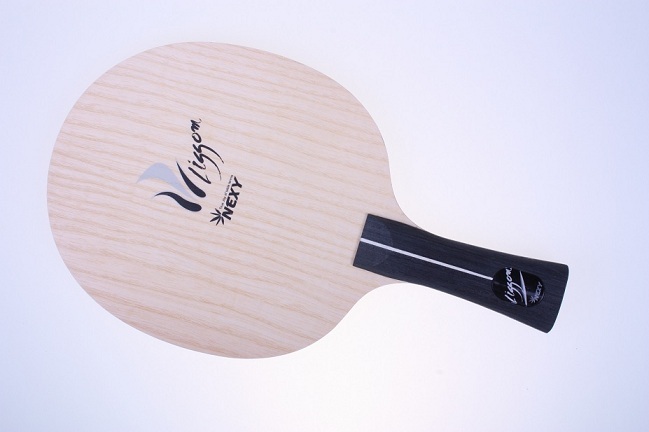 For an example, many blades are using Koto on their surfaces, but most of them use very thin Koto, and in that case, it becomes like a very thin metal plate, which affects on the ball directly, but also helps the ball go into the second or center ply. The feeling of those blades also comes from the second ply, not only from the Koto surface. Someone on this forum mentioned that Koto is a soft material, and I think it's because of this reason. The general feeling of Limba is embracing, but when I used it thick or doubled the feeling was not too embracing. And also Hinoki, when I used very soft ones, the unique feeling became weak, and the second ply affected on the ball more directly. So, it also depends on the thickness of the material. Any way, if you ask what will be the moderate thickness for them, I think for Hinoki, it will be from 0.8mm to 1.4mm. For Limba, it will be from 0.3mm~0.7mm. For Koto, it will be 0.3~0.5mm. This is my personal conclusion. Ok, let's move on a little further. When I design my Hinoki surface blades, I use high quality Japanese Hinoki. Hinoki has many grades. If you look into the surface, you will notice that there are lines. One line represents one year of tree growth. So, if you want to use Hinoki for a blade, then it has to be at least 200 years old. If not, the width is not enough to cover the entire surface of the blade. And generally, players don't like a blade that has several Hinoki fragments. If the line is wide, there could be two possibilities. That wood is not good. If the mother tree were young, then the lines would be wider because they are new, and the feeling is soft and speed is not very fast. Another possibility is that the material has come from the core part of a big old tree. In that case, the wood is also soft, and the speed is not very fast. But the prices of these two materials are much different. If the material is from the core of a very old tree, it's extremely expensive. I use soft Hinoki for all the Nexy blades, and I prefer to use thick plies. Generally, many Hinoki blades' surface are 0.5mm thick, but I normally use thicker than that. When using hard Hinoki, 0.5mm will often be ok, but with soft Hinoki it has to be thicker. If not, the ball will be overly affected by the second ply, and players will not get the full effect of the Hinoki surface. Let me give a practical example. Here are two blades, one is DEXTER and the other one is HANNIBAL. For DEXTER, my purpose was quite simple. I wanted to make a 5-ply blade, which was faster than a normal carbon blade. So, I had to make the center ply thick and use fast spurs on the second. But if I made the blade too fast, then I was worried it would be too bouncy. So, I had to find a material that made the ball spinny, even though the staying moment of a ball was very short. In that case, Hinoki was the best choice. This blade was like an announcement for my brand. Nexy is different. It's a bold brand. And I wanted to prove it by showing the fastest 5-ply blade, DEXTER. But for HANNIBAL, my purpose was quite different. Carbon has been quite an attractive material for blade construction, but unfortunately, it often feels too artificial. So, some European makers tried to use it in the third position, or to use a very thin carbon layer. Some brands even claim to use it when in fact they do not. For example, they mix the carbon powder into the glue, and claim it’s a light carbon blade. But in that case, that carbon glue ply becomes shaken — little by little and eventually changes the character of the blade. Some makers tried to use only one line carbon, which meant they didn’t use carbon as one ply. While other makers mixed carbon layers with other artificial materials. Still, I still find a carbon layer to be a very attractive material, even with its potential problems. For me, the biggest problem is not only about feeling. I was more interested in how I can make it effective for a bang impact swing. As you might have experienced, many carbon blades are good when you practice basic skills, but in a match, they don't have good spin and feeling, and they lack power, even though they are fast. I began to wonder how I could prolong the staying moment for a fast bang impact swing, and I discovered the solution. I used very light and resilient wood for the center ply. And I chose very soft Hinoki for the top ply, but thicker than most other blades. So, it's approximately 1.3mm thick. With these two new factors, I could get very good stay​ing moment needed for a bang impact shot for HANNIBAL. Someone recently asked me what blade would be good for short pips players, and I recommended HANNIBAL. This blade has a very powerful smash, but it also has enough staying moment needed for a player who wants to make use of the full range of pips-out play. I have one Koto blade, IKARUS, and I'm going to release another, LABYRINTHOS. The reason I use Koto for these blades is I want to create a greater pips-out's effect. Actually, there could be several different styles of pips-out players. And if I use soft material, then the staying moment can be longer than Koto. But in that case, the pips-out effect is also affected by that softness. Most push blockers prefer OX because that allows for maximum effect. Therefore, you can understand why I use the hard, solid Koto on the surface. If I use a soft surface, it would be like I added a thin sponge onto an OX rubber, which reduces the pips effect, i.e., reversal, wobble, dead ball, disruption, etc. Regarding MUSIRO and MILARGE, I use Limba to add more control than other standard blades. This enabled more stability, even when using long pips rubbers. On the contrary, I use Koto for IKARUS and LABYRINTHOS, because I want to maximize the pips-out's effect. OK, this was not a short story, but I hope most players have gotten something out of this passage. Some of my explanation will not be exact with the blade you have, because it's not that simple. Even if you use the same material, the effect will likely vary depending on several factors, including the weight of each material and on the total composition. I don't expect you to accept my writing as a decisive conclusion, but rather as a way to understand your blade better. Thank you for reading through this article. I changed the title of this thread. I think I will keep on writing on this thread, how I think, how I design, and how I study. This thread will devote itself to show me, myself as a designer of nexy, as a player, and as a person. I hope you guys can enjoy this thread. By the way, here I have one more topic. 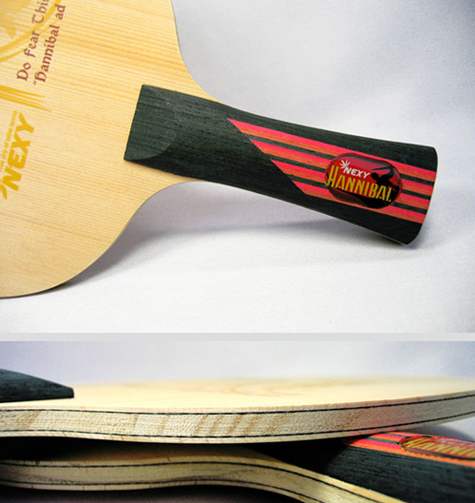 This is fantastic material for table tennis blade. Most people now think they know this quite well. And also most table tennis blade designers think that way too. I think I have vast ocean to swim through to find still something new, veiled, hidden in the deep water. Carbon ply was found by butterfly brand, and later on lots of European brand trid to follow it. But the first carbon blades shown by Butterfly did not attract European market a lot. European market thought carbon blade is too much bouncy. So, Donic, Stiga.... started to make soft thin carbon blade. And some blades were using carbon layer deeper than second layer. They thought they can neutralize the carbon's too much bouncy character by keeping it deeper. But that was little bit dull idea I think. They didn't have to neutralize; if they really want to newtraize, then why they use it? Rather they had to find how to harmonize it better. Some brand used balsa to make it light. But balsa has a kind of hollow feeling, so when you joint it with some other material, then you need to think about how to make up for that hollow feeling. For normal long pimple our rubber blades, balsa was good material, because they need that hollow feeling. But for others, I think it should be careful. Carbon is the most attractive material, among all the artificial materials for blades, I think. It's solid and hard, very good for adding more power onto the ball, plus not very heavy as you might think. If this can be matched with good wood, then it's perfect. It can have good vibration, solid feeling, and also pleasant touch. That's how I made my blade Hannibal. I think I will try this material with my next version blade. I will prove how attractvie a carbon layer can be, with my next blade. Please, European players, don't think little of Carbon layer. When it is in good harmony, like in hannibal, it can be really good. This is so cool. I like the way you are thinking and how you write about it. Truly you have your heart in what you are doing for table tennis. But my current idea is quite diferent one. You will see it some time later. Nexy ur love and devotion for the game of tabletennis reminds me of myself. U want nothing less then the best and will do anything to achieve it. U wont forget a single aspect, thriving for perfection. U want nothing less then the best and will do anything to achieve it. U wont forget a single aspect, thriving for perfection.You have my respect. Thank you very much, I'm really honored, more than what I truly deserve. I apologize to anyone who hoped this article would be posted sooner than today. I decided to write once per week because this kind of writing takes a great deal of time and energy. Today, I will write more about Hinoki because I discovered that this material is the least understood wood for players outside of Korea and Japan. Recently, I received an inquiry about a Hinoki one-ply blade, and he was not satisfied with the price I quoted him. But after I explained why the price was high, he replied with apologies. So, I thought maybe I needed to provide more information about Hinoki to help educate about this wonderful wood. When Hinoki is used for the surface of a blade, as I wrote in a previous article, it makes the player feel like the ball is sticking to the blade. If your swing movement is fast, then you will feel the fall follow the whole arc of the blade's trajectory. In this way, Hinoki feels different from other materials. So, you can make an effective topspin shot even when lightly grazing the ball. When you hit the ball, the ball follows the blade and moves slowly with a big spin, coming out too slow to be seen clearly. Many Koreans can do this kind of slow but spinny type of looping, because they have been playing with Hinoki for many decades. We call this a "fake loop," because sometimes the ball comes after the blade, due to it's slow speed. If your arm moves very fast and the ball is hit very slightly, then the ball flies after the completed swing, and everybody can see the ball fly slowly after the blade. It's an awesome and surprising moment, because it takes away the expected timing for the opponent. And, sometimes even when the opponent blocks the ball with correct timing, the ball is too slow and weak and doesn't react in the usual way — it creeps onto the rubber of the opponent's blade, and then goes high, surprising the other player. This is one factor I like about Hinoki material. It's good to make the ball follow the blade, but on the contrary, it's also harmful for a player to learn this kind of looping skill. In Korea, it is common to see players relying only on a "fake loop" instead of normal powerful loop, because it's fantastic to feel how it works. But sooner or later that kind of style will be defeated by a higher level player with more advanced, effective strokes. If the other player knows how to effectively block with the appropriate angle, then that kind of style defeats him. So, a fake loop is not good for players trying to improve his or her level. Anyway, I think there may be some players interested in this kind of fake loop. I used to do it when I played with one-ply Hinoki, but now I lost it. I hope I can demonstrate it someday in a video clip. 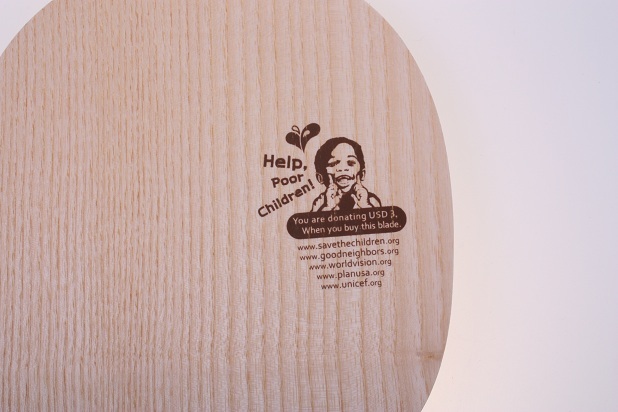 There is another distinction you can easily feel when using Hinoki as a surface wood.. If you block the ball, it works really well at controlling the length of the ball. If you push down your blade with good angle, loosening the power, then the ball will fall short. It's a very sensitive moment to enjoy. You can feel how the ball touches your Hinoki surface, and to goes back with a steady trajectory. The blocked ball moves in a stable way because the trajectory is higher and with good control. It will not be very aggressive, but you will feel comfortable as you hold and control the returning ball. I think this is very fascinating factor, and that's the true merit of Hinoki surface. This factor also comes from the first factor, which is its feels sticky. Yes, there are demerits in Hinoki. It's not a magic material. The first thing is, once you are accustomed to this material, you will no longer be comfortable with other materials because Hinoki has it's own distinctive swing trajectory. Using Hinoki will change your swing movement. This happens little by little over time. You will fold your upper arm faster, and will get better speed and impact, but the angle of the blade can be different from other playing surfaces. Your swing might become faster, but you will lose the general movement that many players think is fine. I can say this because I've experienced it while studying and comparing Hinoki to other materials. Another demerit will be price. Hinoki material is extremely expensive. Most Korean and Japanese players used to play with Japanese penholder grip, and that style is totally different from normal shakehand users. The most popular blades were one-ply Hinoki, and if a player wanted to have enough speed, the bladed needed to be about 10mm thick. Therefore, the one-ply thick Hinoki plate was, and still is, needed for production. But if you use that Hinoki plate, then it needs to come from one tree trunk. It cannot be glued together from different pieces of different trees. If you look closely at a piece of Hinoki material, there are vertical lines. Each line represents one year of growth, because it is made according to the speed of growth. When it's warm, it grows fast, but in winter, it's speed is slow. So, when it grows slowly, it yields a darker color, which results in darker lines. Normally, one blade needs a width between 150~200 lines. If a tree is 100 years old, then it will have 200 lines; 100 lines from center to each other end. So, we can say that if we want to make a blade without joining pieces, then the mother tree needs to be at least 100. But it's not only about width. If a tree is 100 years old, then the blade will be soft and not very speedy. Young parts are softer and weaker, while old part are harder and more solid. If a blade is made from a big old tree, around 300~400 years old, then we can cut one blade from one part, and another in the middle, and the best one in the center. So, the width of the tree determines how we can get the Hinoki plate to make a table tennis blade. And one other important thing, old trees have more vibration, making the ball seem lighter when hit. Old trees also have less deviation than younger tree. By the way, all those big old trees are reducing in numbers, so the price of raw materials is increasing steadily. ( 1) Are they soft and weak? Or hard? If they are soft, then they are from a young tree or from the inside of old tree. If they are from young tree, then their price can be cheaper, but if they are from old tree's center part, their price is priceless. But in fact, they are not very different. Actually, blades made from the inner part of a big old tree are almost the same as the one from small young tree. Recently, the price of the blade from that old tree's center part is two or three times higher than several years' ago. But I think the difference is not very wide from the one cut from young tree, if we are making a several plies' shakehand blades. I mostly use that soft part for my blades. But still that material's price is very expensive compared with other surface material, and that's one reason that I cannot sell our hinoki surfaced product inexpensively. There are several brands using American or Taiwanese Hinoki. Those Hinokies are inexpensive, and their characteristic is quite different from Japanese Hinoki. Taiwanese Hinoki is heavier than Japanese Kiso Hinoki, and the function is very different. In my own opinion, I don't think it's a good surface to use as a blade material. (2) Do they have vertical lines with constant distance, or are lines getting wider in one direction? If a material is cut exactly on the center, then the lines will get wider in both directions. If not, it should get wider from one side to the other. Normally, it's not easy to find all the lines keeping the same distance, because young parts close to the outer are wider, and also the part heading south grows wider than the part headed north. 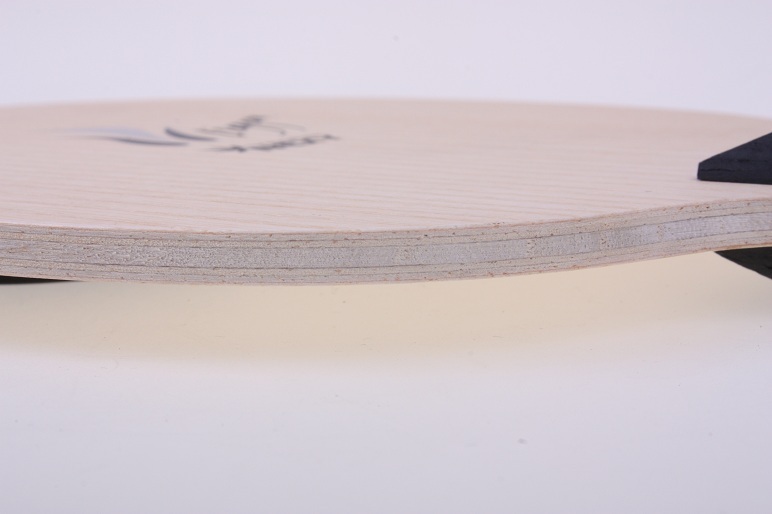 So, normally, a wooden ply cannot keep the same line width throughout the entire blade surface. (3) Are they heavy or light? I think you already know the answer. If the material from inner part or from younger trees, they tend to be light. Anyway, that's why expensive blades are light. Most expensive blades are cut from the inner part of an old tree, and they are soft and light. So, some brands are making them 10.5mm thick, not 10.0, because they need to cover that lightness with a light material. (4) Are they brown or white? Hinoki typically has it’s own range of color. Some are very white, and in that case, most blades are from the inner part. If Hinoki wood is brown, it’s probably from the outer part of a big tree, which is more expensive than the part from young tree. We can also guess it’s character by looking at it’s color. I prefer to use a soft Hinoki material. If I use a hard surface, then the overall specs will be different. But when I develop new blades, especially for Hinoki models, I try to demonstrate Nexy's character, which is harmonized and well-balanced. With the soft material, I use a little thicker outer ply than other general Hinoki surface blades. In many cases, the Hinoki surface is about 0.5mm or thinner, which it's not easy to get a "bang impact" effect. 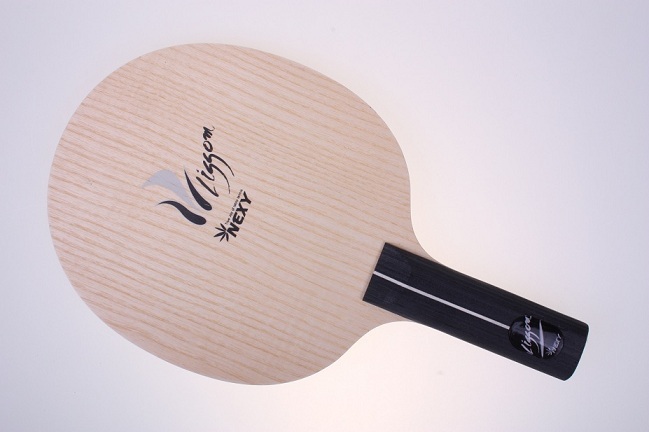 If a thin Hinoki surface is capable of making a speedy topspin shot, then it will not guarantee enough "staying moment" needed for a "bang impact." So, I chose to use soft Hinoki, but thicker than 0.5mm, and I calculated in each blades how to harmonize that thickness with the other plies. Among the 4 blades listed above, the Hinoki is softer for HANNIBAL and OSCAR. I use a very soft material for both, because I need to employ a better feeling into those blades, which are mixed with artificial materials. 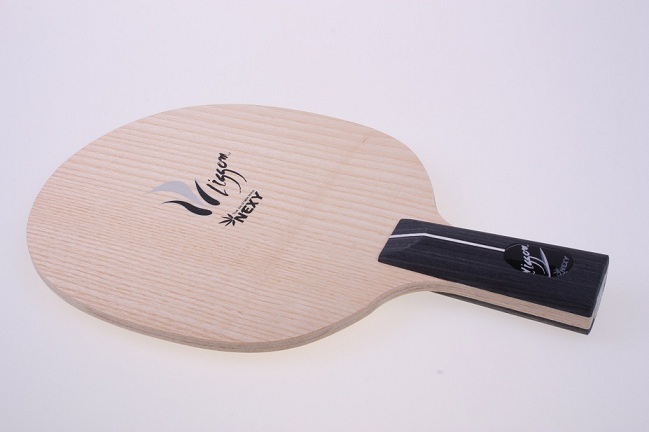 If you look at most well-known Hinoki carbon blades, they are using a 0.5mm or 1.0mm Hinoki surface. But if it's 0.5mm, the ball is too bouncy; and if it's 1.0mm, you don't have good feeling onto your hand. But I solved these seemingly incompatible problems by using a soft, but thicker Hinoki, matching it with a secret light and bouncy center ply. So, when you play with HANNIBAL, you will be surprised to know that this blade is very soft and it grabs the ball inwardly deep as well as very soft and light. 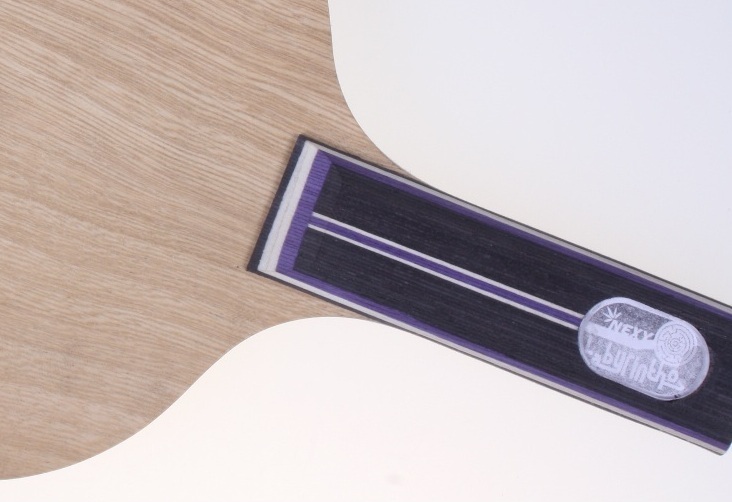 With this softness, you can feel the balance between the fast carbon layer and soft touch of the Hinoki outer ply. With OSCAR, I spent over a year and a half experimenting to ascertain an extreme natural feeling, which was not seemingly attainable with an arylate carbon ply. 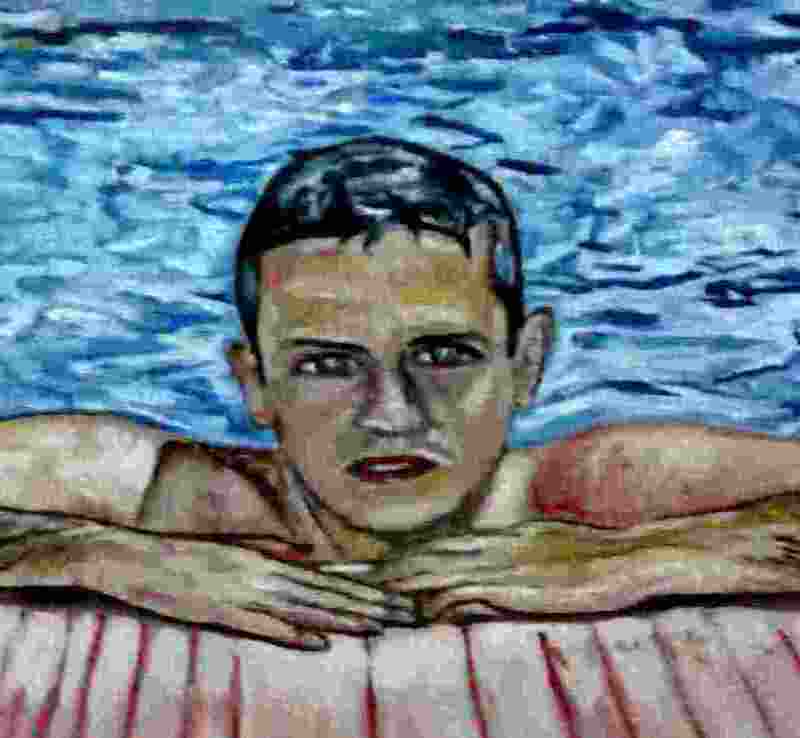 I studied every possibility by mixing and matching different thicknesses for the surface, and that was the time when I was sure that I decided to consummate the constitution of OSCAR as it is now. I used a thick, but not too thick play to help carry a good feeling and power needed for this well balanced blade. Regarding DEXTER, I thought I would open my new brand with something surprising and outstanding — something much different from all other 5-ply blades — something impossible to overlook. So the result is the most speedy 5-ply Hinoki blade. If I used other material for DEXTER, then the blade will not be catching the ball enough to make spinny shots. But I chose Hinoki for the surface, you could make a spinny shots when you have a high impact. By the way, I think if your swing movement is not as speedy as an average Asian player, then you will not be able to think that this blade has good spin. So, I thought I had to make another one with better spin and good balance, and that became the reason for my next blade COLOR, which became an attractive item for many players. Ok, I think there could be a lot more to say, but it will be too much for me to write and for you to read. I will write more in the next article. If anything is unclear, or if you have any further questions, please let me know and I will do my best to respond. No opinion about the upper writing? I'm quite sure most players haven't given the head size of their blade much thought. I rarely did. Whenever I bought a blade, I checked the thickness and the handle. If a blade is too thin, it vibrates a lot; if too thick, it lacks feeling. It's a big problem if a handle is not comfortable. Also, many players might have their own suitable or preferable weight. 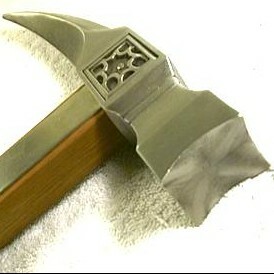 For example, some women, elderly, disabled, or injured players might prefer using a lighter blade. So, the size of the head was the last thing I considered. But as a blade designer, I found out that it's an extremely important factor. You can do an experiment on your own with the blade you don't use. Just trim a small piece off any blade, and the feeling will be totally different. Even 1mm could make a big difference. It will not feel like it did before. Not too long ago I checked out several new blades made by a well-known global brand. They looked really great and had impressive specifications, but I could not say that their blades would be successful, because the head size was cut for show, not performance. They were very fashionable and had a comfortable handle, but the feeling of the blade was not so promising. I could tell this by the head size alone. Several European brand consider head size as a brand identity. They stick to their own head size and style. They try to keep that size as a representation of their character. But in the end, many of these promising blades become a short term fad. They cannot survive the test of time. This saddens me. I do want to claim that a blade's head size is not about brand identity at all. It should be related with each blade's function and character. Ok, here are some basic guidelines that most of you will easily agree on . . .
● Hard and focused feeling. ● Good for close-to-the-table shots. ● Not good away from the table. ● Unstable for a big, slow stroke. ● Good for short, fast movement (still not too stable). Bigger head results in (there are very few blades with larger head size, except for defensive blades. So, I don't think I need to write about this, but I will still try to give some information. Anyway, most Chinese blades tend to be larger than blades from other countries, except for specialty blades). ● More vibration than a modest blade, but less than a smaller head size. ● Easy control and stability, but not agile. Actually, I know many Chinese companies, and most them are making their blades the same size of Stiga blades. But they cannot are not the same because they clearly trace the head size Stiga blades by using a pencil and paper. This naturally causes their design to be slightly larger than original, especially the round part where the pencil automatically moves in a wider circle. If they cut the head the same size as Stiga's, then would still they have some problems because the handle size cannot be the same as the original blade. Therefore, it would not be balanced correctly or comfortable. Regardless, I think there would still be a wide gap between the original and the copy due to the sensitive character of blades -- very small variations make big differences that are felt by players. That's table tennis! ● Weight between head and handle. ● Overall weight balance, which is related to the sweet spot. Due to these factors that are related to balance, I think most of Nexy blades are very well balanced. I've never heard of any criticism about the balance of Nexy blades, and I will do my best to keep it that way! I'm quite sure lots of people don't think much of this. It was the same for me. Whenever I buy a blade, I checked the thickness, and handle. If the handle is not comfortable, then it's a big problem. And if a blade is too think, it vibrates a lot. And too thick, it has less feeling. So, size of the head was the last thing I counted. But as a blade designer, I found out it's extremely imortant factor. You can do experiment on your own, with the blade you don't use. Just cut some part, like in one blade, each side, and in the other blade, the top part, and also you can cut the whole head. If you just cut one mm, then the total feeling will be very different. You will not feel it's the same as before. Recently, I saw several blades made from a new brand. They are well known global brand, and they were really great in all details, let alone good designs in all things. But regarding blades, I could not say that they would be successful. Because they cut the head size only as they wanted to show. It looks nice, very comfortable handle, and fashionable. But the feeling of that blade was not so promising. I could tell it only by looking at the head size. Lots of European brand thinks of head size as a brand identity. They stick to their own head size and style. They try to keep that size as their character. But in the end..... most of promising blades are becoming short term fad. They can not survive in the long term. I'm really sorry for this. I do want to say that blade's head size is not abour brand identity at all. It should be related with each blade's function and character. Ok, here I will give some basic rule you can easily agree on. (Normally, there are few blades with bigger head size, except for defensive blades. So, I don't think I need to write about this. But I will just try to give some information. Actually, I know lots of Chinese companies, and most companis are making their blades the same size of Stiga blade. But they can not be the same. Because when they draw the head size of Stiga blade by using pencil on the paper, they naturally make most part slightly bigger than original one, specially round part, where pencil automatically moves in the bigger circle than the original blade. If they had cut the same size as Stiga's one, then still they have some problem left. Because the handle size can not be the same with the orignal blade, so still they have some part uncomfortable. Any way, I think there still exist wide gap between the original one and copied one, due to the sensitive character of blades. Very small variation makes people feel widely different, that's table tennis. By the way, from my experience, now I'm focusing on balance of each blade, whenever I design. All those things are related with balance. Due to these factors, I think most of Nexy blades are well balanced. I've never heard of any criticism about wrong balance related with Nexy blades, and I think I will keep on doing this way. The shape of the blade is very important. However some manufacturers do not pay attention to it. Everything is related in a blade. 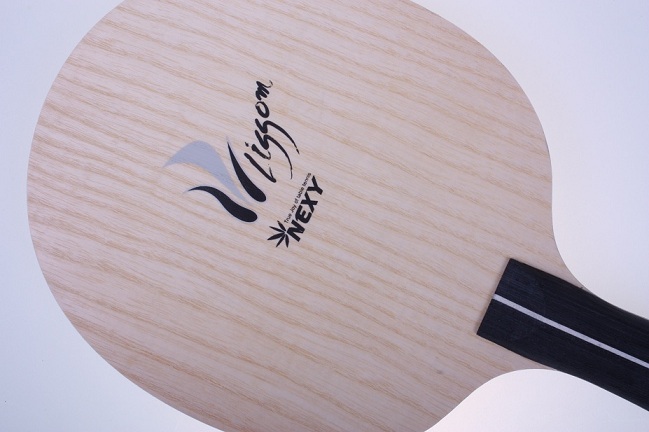 Thickness, balance, handle, performance and blade head shape. I had the chance to test the spear and i realized the design payed attention to it. I also had the experience about changing the design of the handle because the head blade shape went to different torsional strength in the neck. Even the handle design may need to be different. Shape wings in an aircraft are also determined because torsion and flex resistance. Concorde aircraft wings shape is not the best from aerodynamics point of view but also in a balance about torsion and flex resistance. MM T05(fh)/Srvfx(bh); InfVps,LSW,Viscaria,RwV,TBAlc,PG7,yextsc,yeo. EJmaster wood. Today, I'm gladly introduce a new item to you. This is a new bag designed by NEXY team, named "PNEWMA". I hope this bag appeals for you. Here are some more details for you. You can watch how it holds so many things in so many different places. You can meet the bag here. Zhang Jike and Li Ping and Ma Long fan! wish I had one how much is it? Playing with my NEXY Oscar I took a look at the lines of the hinoki. 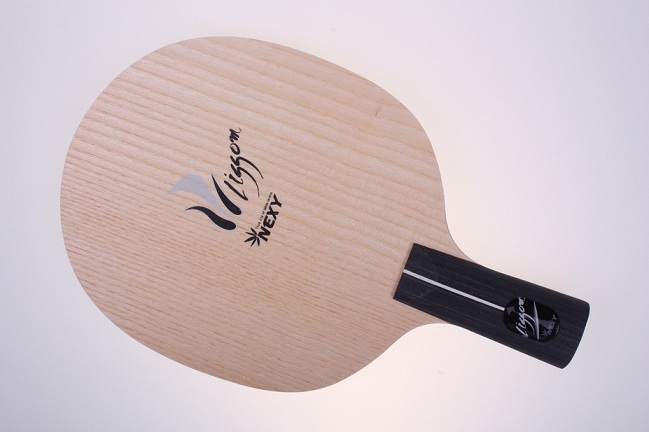 I noticed all my NEXY blades that 1)the hinoki are pretty white and 2) they are placed to favor right-handed players. 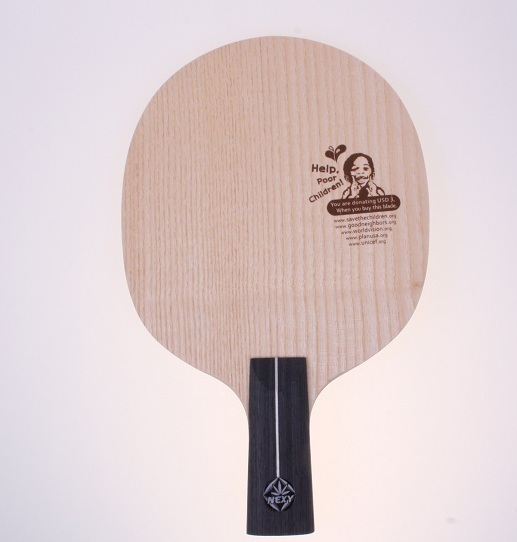 The hinoki are placed so that the lines are tighter from the left to the right for forehand, as you hold one of the rackets on your right hand. The backhand would be also favoring the right handed player by the same token. I really respect your professional knowledge. Yes, the honoki wood used for my blades are white woods. This white color means that they are soft honoki. I prefer soft material to hard one. Personally, I think soft wood can be attractive if jointed with enough speed. But if that soft surface is too thick, then the feeling can be too smooth. So, balance is needed when you joint soft hinoki. Therefore, most my blades are using soft wood with speedy material, carbon or sprus. Regarding the lines of honoki, lines are wider, if the part is close to the center of the wood, or if the tree is young. And also that part is located southward. Anyway, most Hinoki has to have wider or narrower part. And mixing those part depends on production. As for me, I don't care much. From my experience, the mythology about lines seem not much strong factor on the fuction of the blade. It's not only about lines, but about age of a tree, color, inner or outer part, souther or nothern....so many complicated factors are influencing. So, considering those all things, if I really want to take care of those lines to fit left or right handed play style, it will be to much. I feel sorry to tell you this truth, so I don't care much about lines. But I do care about softness....the basic character of the material. 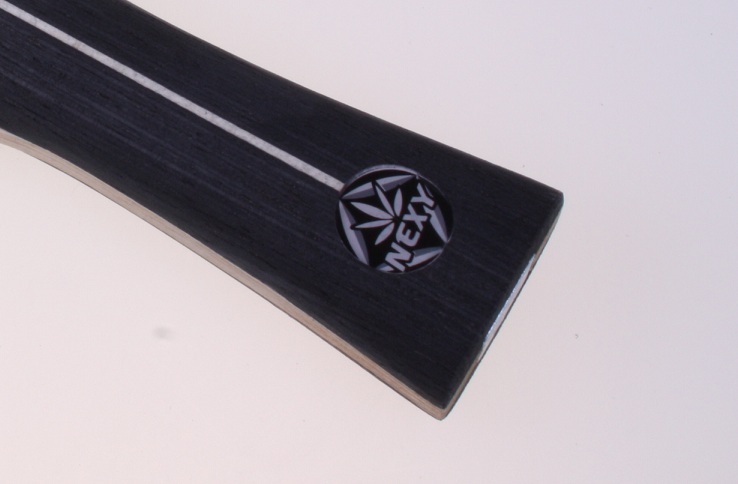 the Second Wave for NEXY blade design. If I can use he term "wave" for the designing work of Nexy, then I can categorize my nexy blades into two different waves. The first wave's core topic was Hinoki surface. I found out that Hinoki had lots of attractions, but most other brands did not know it how to maximize that good attraction harmonized with other traditional blade compositions. If we select one traditional 5-ply or carbon contruction, and only change the surface from Limba or Koto to hinoki, then we can not make full use of Hinoki's good character. So, I thought there could be some room that I can show how Nexy can be diferent from other brands. It took 3 years to complete that study. I released many kinds of Hinoki surface blades, and I loved all of them. They are very characteristic in their own ways in all things. 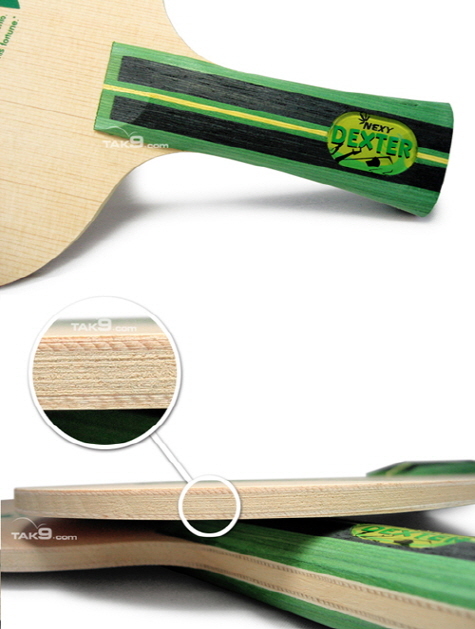 Dexter : the fastest among 5-ply hinoky surface blades, without any artificial material. Hannibal : smooth and well balanced hinoki carbon blades, good for short pimple out rubber attackers, too. Oscar : well balanced, and very natural feeling, computerized blocking- very well organized arylate carbon blade. Color : moderated 5-ply hinoki surface blade from Dexter. beautiful hamony in all things. Iskandar, Temujin : Hinoki one-ply J-pens. I found out that I have to try something new. And I started to move somewhere else. That direction goes the other end of the road, where most other brands did not try. After speed gluing banned, most global brands thought that they had to find out some blades faster and stronger. So, they tried to find some material harder for the surface, and they made the blades thicker. Or else, they release lots of new blades inserted with fast artificial layers. But for me, I did not think that way. If a blade become faster, it loses something in the other hand. That could be spin or control. Sepcially regarding spin, if we can energite more spin, it becomes more power and speed. So, once we can make bigger spin on the ball, then the initial speed of a blade can not be mettered much. Here comes the factor which changed my blade design concept from Hinoki material into some other direction. That's how the second wave of nexy blade desing occur. If I want to make more spin, then what will be the needed chracter of a blade? The next generation blade should promise two things. Number 1 is simple factor. So you don't need more explanation. But number 2 is not easy to understand. I'm not sure how to express that character in Englsih, either. By the way, if I explain it by examples, then you can compare Koto surface and Limba surface. Koto does not embrace the ball compared with Limba. But most limba blades feel that they embrace the ball deep into their chest. This feeling is very diferent from Hinoki surface. Hinoki feeling does not relate to the inside of a blade. It's sticky feeling stays only on the surface. But embracing feeling means that blade seems to embrace the ball into it. So, I tried to find the way to make bigger embracing feeling and longer staying moment. The first result came out as SPEAR. And my second result is about to come out as "LISSOM". Lots of good players tested Lissom in Korea. Their first response is being amazed by that embracing feeling, just like SPEAR. And their second response is how this blade is that light. It's because they are only 5.7mm. Any way... I can not tell you all the secerts about LISSOM here. But I think you will know what is the result of that second wave sooner or later. While designing several nexy blades, I made a big change about C-pen size. I used to make it 157*148, but recently my C-pens are 159*150mm. I think if I explain why this change happened, then you will come to know a lot about C-pen's distinctive character. Lots of people were influenced by top chinese players' magnificent C-PEN players, because they were so powerful on the TV broadcated worldwide including olympic games. Even in Korea, lots of people are now moving from J-pen to C-pen. They think J-pen has a fatal weakness on back hand side, but changing into shake hand is too much for them. Actually, I also changed from J-pen to shake hand, and it took many years to learn back hand sroke and loop. I think lot's of good training for J-pen worked against learning new way of shake hand for me. Compared with shake hand blade, C-pen looks easier to change from J-pen, and lots of Korean players are trying it. It will be a different story from normal shake hand to C-pen users in Europe or America. When you move from shake hand to C-pen, then you will not feel much differance about weight. But when you are moving from J-pen to C-pen, added weight becomes a big trouble. When you play with J-pen, you use only one rubber on one side. So, the weight becomes pretty bigger when you attach two rubbers on C-pen. Heavier weight is also troublesome for ex-shake hand players, too. Becuase now they have to handle all the weight on the fingers fingers and wrist, not on palm. And in both cases, you will feel that you lost some power, because most J-pen is thicker than c-pen, and most shake hand blades are using effectively the whole elbow and arm. So, it will take quite a time to get used to this trouble. Once you overcome this weight problem, then the second problem will be less power. Most J-pen users play with big powerful shot. They tend to play for it. Once they have a chance, they don't expect to hit returning ball. So, they are focusing on one big shot. But with C-pen, that big shot is not easy. Rather, they need to get accustomed to long rallies. So, then they try to find which blade can make good spin and constant looping. When I design new C-pen blades, I tried to handle these problems, and my first solution came as a smaller head size. I tested how small I can make a blade. And some of my blades were 157*148. By the way, while I keep that size, I could get reviews from Korean players. They were generally satisfied with that size. But several top players wanted to have bigger head size, because they wanted more power. So, for my recent two blades, Lissom and Spear, I decided to make the head size of them into 160*150. With these size, I think C-pen players can enjoy well balaced weight and good power together. Specially with my LISSOM, the 5.7 thickness will make players feel easier to play with. Their fingers will feel smaller pressure due to it's thin thickness. I will wirte more about this blade later. This is not the final version, but very close to the final one. And I think some people might notice what's the uniqueness of this blade. If you can see what will be the character of this new blade, then please, leave a note here, and I will comment on those. Mr moon, is that Lissom? I add two more pictures. I will post Lissom pictures very soon here. Just wait a little more. Here are the pictures of newly born LISSOM. I wish all people here felt something intersting from these pictures. There must be some more than what your eyes meet here. Wow looks awsome Mr Moon!!!! !